PanARMENIAN.Net - The Eurasian Economic Union (EEU) could welcome Iran as a new member in May, according to Russia’s Energy Minister Aleksandr Novak, RT reports. “The move to enter into a temporary agreement making for a free trade zone to be set up between Iran and the Eurasian Economic Union, which is currently at an advanced stage, will obviously trigger further development of our bilateral trade and expansion of investment cooperation,” said Novak, who is also co-head of the Russian-Iranian intergovernmental commission. Iran’s Ambassador to Russia Mehdi Sanaei said earlier that work on a free-trade zone agreement between the sides that started in 2015 was close to completion, TASS reported then. A trade bloc established in 2015, the EEU was based on the Customs Union of Russia, Kazakhstan, and Belarus. It was later joined by Armenia and Kyrgyzstan. In 2016, Vietnam officially became the first non-regional country to join the bloc. The union is designed to ensure the free movement of goods, services, capital and workers between member countries. 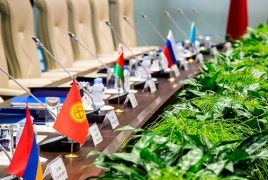 More than 40 countries and international organizations, including China, Indonesia and Israel, as well as some South American countries, have expressed interest in a free trade deal with the EEU. The trade bloc has also held negotiations with South Korea, Egypt and India. In December, Russian President Vladimir Putin said Serbia could be also included in the EEU’s free trade zone in the future.